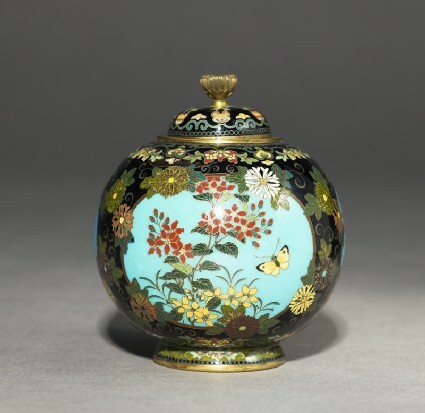 Circular, almost spherical jarlet and cover with three cartouches of birds and flowers on a blue ground, the field scattered with flowers on a black ground. The pierced cover with chrysanthemum-shaped knob and the mounts of copper-gilt. Although unsigned, for Yasuyuki did not sign his work until a few years later than this, we can confidently attribute this small piece to Yasuyuki. By 1890, he was making dark coloured grounds (apparently more difficult than the yellows and greens), with pictoral elements within wirework cartouches. He was to specialize in fine but not excessive wirework, with gradual lessening of the importance of the borders, and the elimination of the cartouche in favour of tripartite patterns without formal divisions. For this, his work was praised by the perceptive judges of the Fourth National Industrial Exposition in Tōkyō in 1896.